The Ahuashiyaku Waterfall is located on the road to Yurimaguas in 14 km northwesterly from the city of Tarapoto. Just 10 minutes walking and a breathtaking view of the 35-metre tall waterfall appears in front of you. Powerful streams of water are flowing from the cliff covered with dense tropical vegetation. Here at the foot of the cliffs a small lake (with a diameter of 12 m) was naturally formed. You can swim here in a crystal clear water surrounded with huge trees and ferns. The depth of a lake varies from shallow, allowing children to splash around, to a smooth descent to the center, where the depth reaches up to 2 meters. Also you can admire the diversity of butterflies and birds around it. How to get: from Tarapoto by taxi towards the Ahuashiyaku Waterfall (14 km / 30 min). Then 10 min to walk. Things to do: the wildlife watching, hiking, photography, swimming. This natural creation can be found in a district Shapaja. 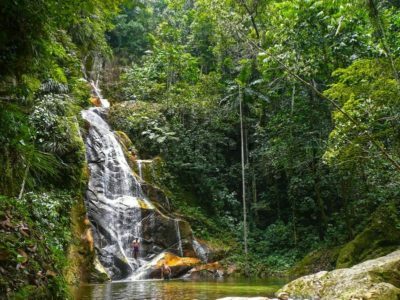 The cascading waterfall has a total height of about 20 meters and a small lake at the bottom with a diameter of 1 m.
The waterfalls are surrounded by lush vegetation that attracts tourists as well as a wide variety of insects. Taking this into account, you need to be careful and use insect repellents. 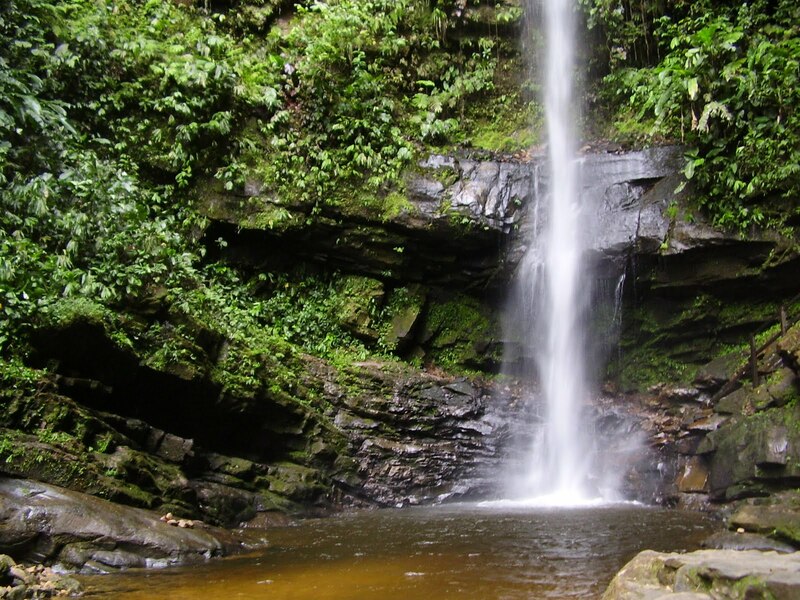 While walking to the waterfall, local guide will tell you about the local wildlife, expressive flora and fauna. In contrast to other tourist destinations, Pucayaquillo was opened fairly recently and therefore there are no large flows of tourists usually. How to get: from Tarapoto by taxi (22 km / 1 hr). Then 1 km (about 45 minutes) to walk. Things to do: the observation of flora and fauna, trekking, photography, swimming. The waterfall is located in the district of Chazuta. Its name comes from Quechua language “fall to fall” and is due to the sound of falling streams of water, which you will hear before reaching the place. This cascade consists of 7 waterfalls, the tallest of them reaches 40 meters in height. All cascades form the natural pools. They are surrounded by lush vegetation that grows here thanks to the humidity near the waterfalls. The surrounding flora includes a lot of medicinal plants, also there are some edible plants. How to get: from Tarapoto by taxi (40 km / 2 hours). Then 9 miles (about 14 km / 2.5 hours) to walk. Season: from Мay to December. Located in San Antonio, in the province of San Martin. Its waters rush from the 20-metre height into the natural pool where you can take a cool bath. It is easy to guess the place where the waterfall is because of a great number of parrots called Wakamaya who live around. The way to the waterfall from the village of San Antonio runs along the river Cumbaza. The route crosses the river for three times. Along the way you can enjoy a big amount of natural Jacuzzis, appreciate local vineyards and have a picnic. It is always recommended to go to the waterfall accompanied by guides (especially by experts on local tourism) because it is very important to know where you can cross the river. You need to keep in mind that in this area there are many insects and spiders, so use insect repellents to prevent bites. How to get: by taxi from Tarapoto to San Antonio (12 miles / 25 minutes). Then 4 km / 1 hour walk. Season: from may to December. Located in 21 km northwesterly from Tarapoto, Lamas is probably the only settlement in the whole Amazonia, which is built not on the shore of a pond or a river. This city is located at elevations from 310 to 920 meters above sea level, so it is more known as the “city on three natural floors”. Lamas is also known as the Folklore Capital of the region. Here there are a lot of various tourist places that make the city so attractive for tourism, for example the observation deck located in the upper part of the city. Also you can visit Ethnographic Museum and the Toroyaku Cascade. How to get: by taxi from Tarapoto to San Antonio (20 km / 15 minutes). Things to do: the observation of flora and fauna, ethnography, culture, local souvenirs, photography. Entry ticket: only for the Museum and the castle. 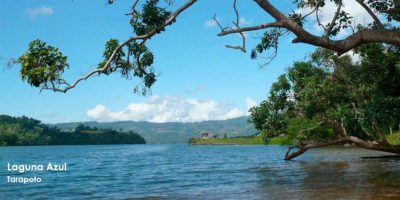 Located in the South district, 52 km from Tarapoto, on the left from the road Tarapoto-Juanjui. On the road you need to cross The Huallaga River in the area of Puerto Lopez. The Laguna offers visitors a healthy air and a healthy environment with good infrastructure. Here you can see tropical aquatic fauna – fish bhurkas, karajama, catfish and sun perch; crustaceans – shrimp, crabs and mollusks. The water color varies from light green to blue with a temperature of 25-28 degrees. How to get: by taxi from Tarapoto to Puerto Lopez (35 km / 45 minutes). Then cross The Huallaga River (200 metres / 15 minutes) and go 18 km on the dirt road (1 hour). Things to do: the observation of flora and fauna, trekking, photography, swimming, sport fishing, water skiing, scooter, canoeing, horseback riding and other activities. Some scientists attribute petroglyphs of Polish to Inca explorers but for others these rock carvings still remain a mystery. They are located near the small settlement Beyo Horizonte (the district of La Banda de Shilcayo) and discovered only in 1966. Petroglyphs look like five stones with drawings in the form of bas-reliefs and scattered over an area within a radius of 1.5 km. The drawings represent the figures of animals, plants and grooves running in two rows so similar to an image of snakes. The Polish name means “open plain” that is associated with a geographic location. This object has not yet been explored properly to speak what time these drawings were created. How to get: by taxi (8.5 km / 25 minutes). Things to do: archaeology, history.